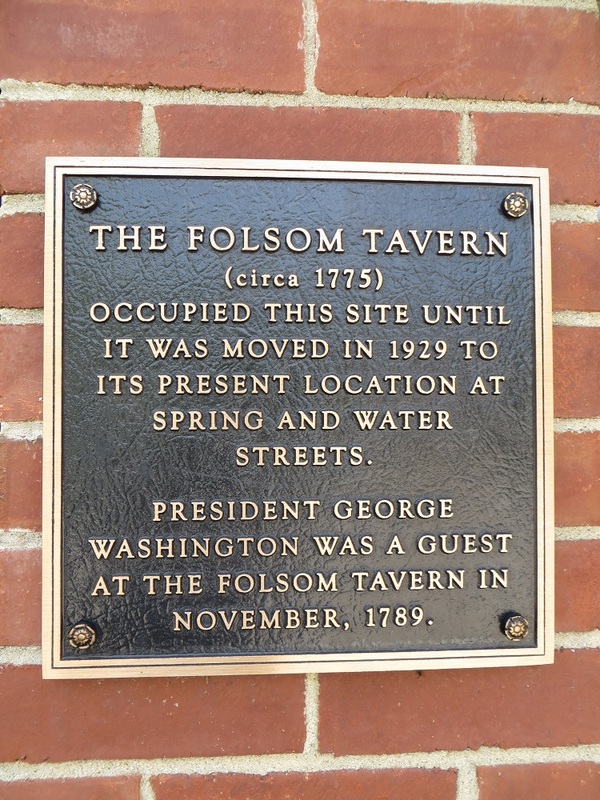 It was a History Tourist first: we were inadvertently locked into Folsom Tavern with two guides. Not that I’m complaining. I think that’s part of the appeal of small museums, that they’re not as regimented and sterile as large ones and make up in character and charm what they lack in polish. Yes, I’m saying that I found it charming to be locked into a museum with strangers. 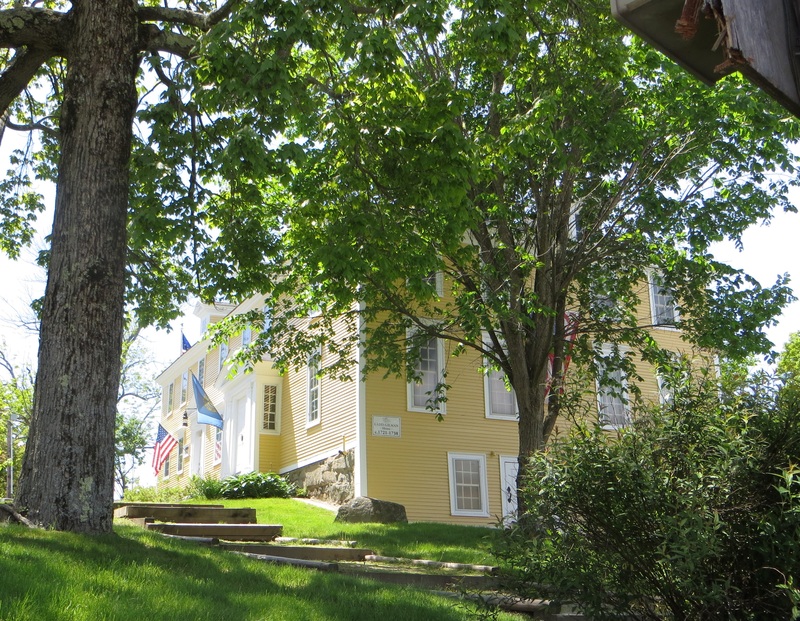 The tavern belongs to the American Independence Museum in Exeter, New Hampshire, which in turn belongs to the Society of the Cincinnati. The museum — made up of the 1775 Folsom Tavern and the 1721 Ladd-Gilman House — focuses on the American Revolution and exhibits (mostly) Revolutionary period military items. The collection is in Ladd-Gilman. My favorite among them: a Badge of Military Merit, one of three known to have been awarded during the Revolution. The Badge of Military Merit, I learned, was created by George Washington to give to rank-and-file soldiers. Traditionally, only high ranking officers got medals, and Washington was the first to give them to noncommissioned officers and enlisted men. He created a couple, including the Badge of Military Merit — “the figure of a heart in purple cloth or silk” — for “singular, meritorious action” (quotes from GW’s General Orders of August 7, 1782). It was the predecessor of the Purple Heart. I was at the museum specifically to see Folsom Tavern, since I am Stalking George Washington. George Washington had breakfast there during his New England tour in 1789. It was bought by the Cincinnati in 1929 and was modernized by a local preservationist who offered to restore it in return for a long-term lease. After she vacated, it became faculty housing for Philips Exeter Academy. It’s now education/event rental space. The tavern was available via guided tour only. Kathie and I were the only ones on our tour, lead by two guides: one experienced and one in training. There was another group already at the tavern, our guides were told at the AIM reception desk, and they had the key. We were upstairs, admiring some 18th century style Windsor chairs made by a New Hampshire craftsman, when one of our guides discovered that the other group had left and locked us in. Everyone whipped out cell phones and within minutes, someone came to let us out. Too bad, because it would have made for a more interesting story to be able to say that I had to escape from a tavern out of a window. The tavern has been moved more than once. A bakery and cafe called Me and Ollie’s now stands on the tavern’s original location, a few blocks away. We had lunch there (good food, snippy service) so that I could say that I ate near — or perhaps on…who knows — the spot where George Washington ate. 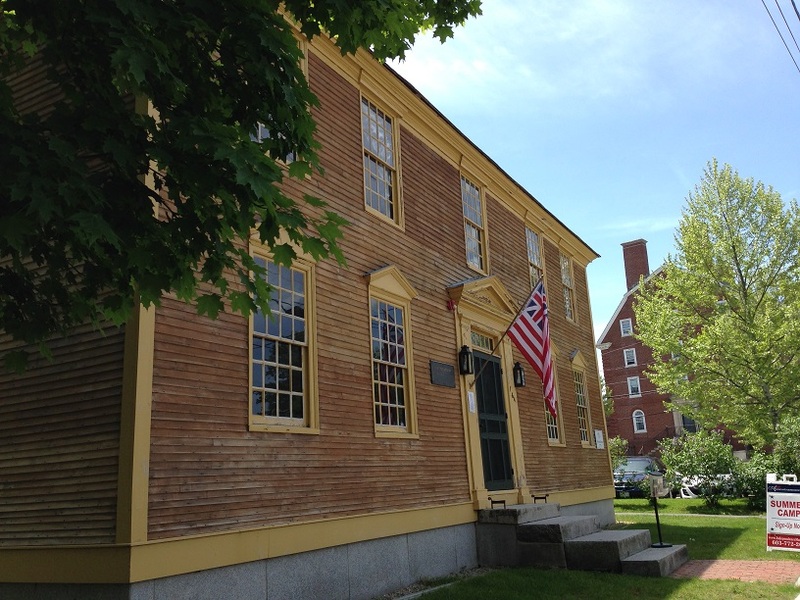 Gallery | This entry was posted in New Hampshire and tagged Badge of Military Merit, Folsom Tavern, Ladd-Gilman House. Bookmark the permalink. Glad you’re enjoying the Granite State. Looks like we tried to lock you in to keep you here…but you escaped anyway. I loved the Granite State. So ridiculously beautiful and so full of history. Just regret that I didn’t have more time there. But I’ll be back…. I didn’t know either. I’ll have to try to remember to pay attention from now on. I love early American buildings too — very beautiful in their simplicity. The New England saltboxes we saw were just wonderful. Good story. I like the way that in the US you are prepared to move a historic building to another site. In Deadwood I visited the Nuttal & Mann’s saloon which had also been moved several blocks. It seems to happen quite a bit, when someone wants the land but not the building. Often, they’ll let it go for free, if the person who takes it bears the expense of moving it. It’s a good compromise between the business people and preservationists. It was great to see the Folsom Tavern’s restoration completed – they were working on fundraising the last time I saw it. The two guides we had were not only informative, but they were fun to talk to. You could tell they were very interested in their subject. I am going to have to work on a list of Must See’s for your next trip North! I liked our guides, especially after hearing the one for the other group go on and on and on. A good guide makes all the difference. I have a full list of stuff I want to see the next time too. And I’ll definitely make sure that things are open!